Destination weddings are increasing in popularity. More and more couples are choosing to plan their nuptials in interesting getaways. In exotic locations, guests take a break from their busy schedules to celebrate a joyous occasion. They often turn the destination wedding into a personal holiday and explore a new country. More importantly, the wedding hosts are able to relax and celebrate while the execution is taken care of by the venue’s knowledgeable professionals. 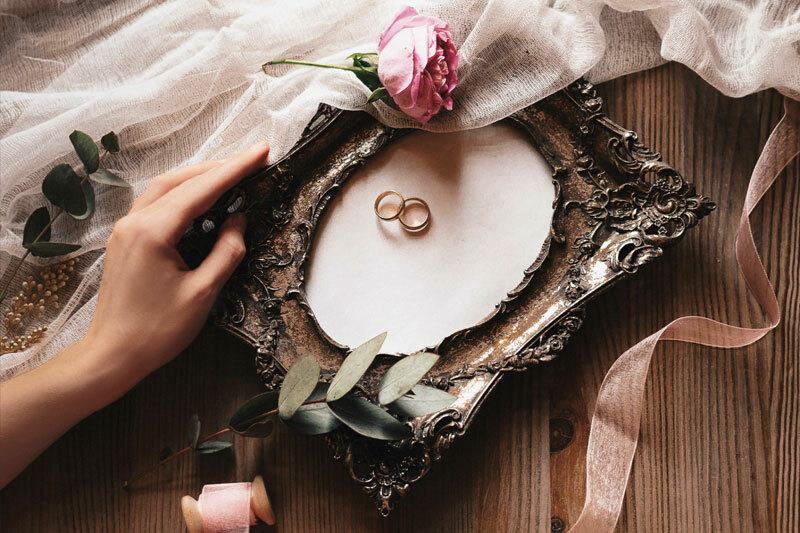 Often, destination weddings turn out to be more cost effective and easier to plan as luxury hotels have a team of experts to make your dream wedding a reality. Home to some of Asia’s most scenic locations and unforgettable experiences, the Kingdom of Thailand is truly majestic as a setting for weddings. A melting port of religious and traditions, the country has a rich history of cultural influences, which are visible even today. Thus imagine a serene beach, a magnificent sunset, crashing waves and soft ocean breeze all coming together as a picture-perfect backdrop for your special day. In the romance of this setting, some couples choose to be bound together by the Thai tradition of tying a string together. 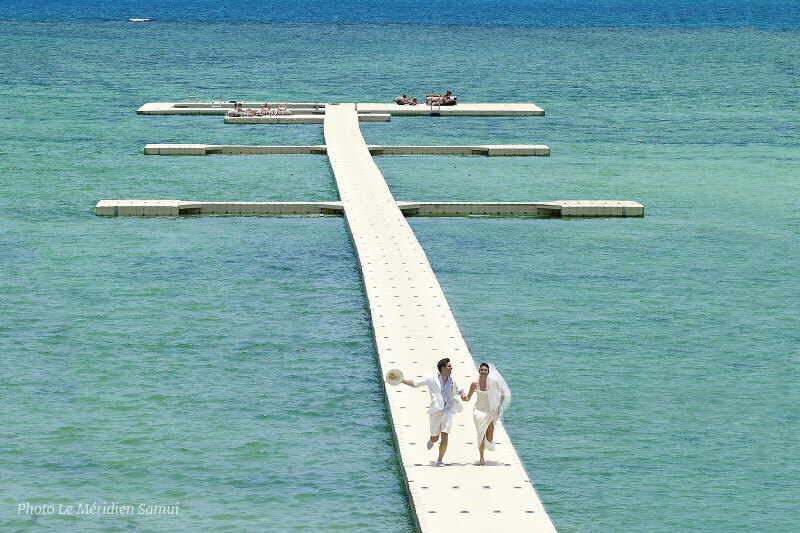 With countless luxury resorts dotted along the shores, a wedding in Thailand offers guests a remarkably unique experience. The country hosts destination weddings all year round and sees over 100 Indian weddings a year. I’ve had the wonderful opportunity of attending over 50 destination weddings all over the world. I have been a part of marriage revelries in places near and far, across the US, Europe, Asia and closer home in Kerela, Rajasthan, and Mumbai, amongst others.euvring sharp curves along the road. Some of my best experiences have been in Thailand. From Bangkok’s famed nightlife to Koh Samui’s serene beaches, Phuket’s hidden gems and Pattaya’s diverse entertainment options, you’ll find the best of everything in this beautiful country. 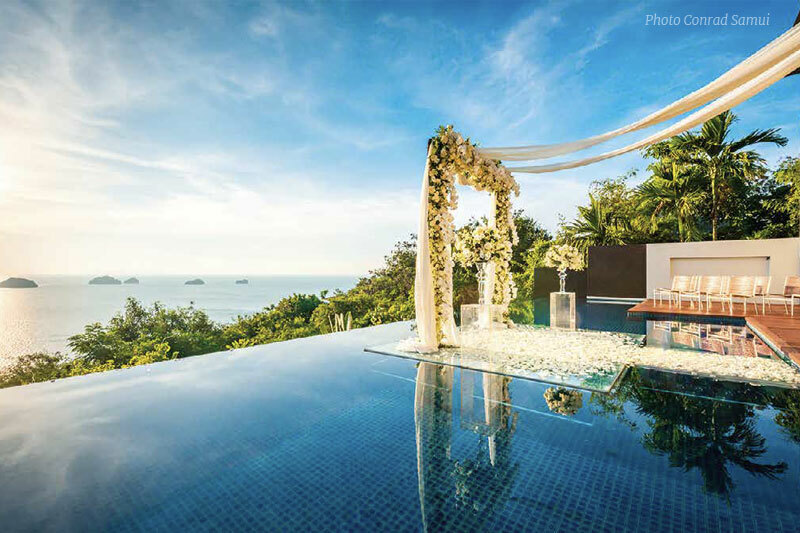 When it comes to astounding, dreamlike beauty, it’s difficult to come close to wedding destinations like that of Koh Samui. 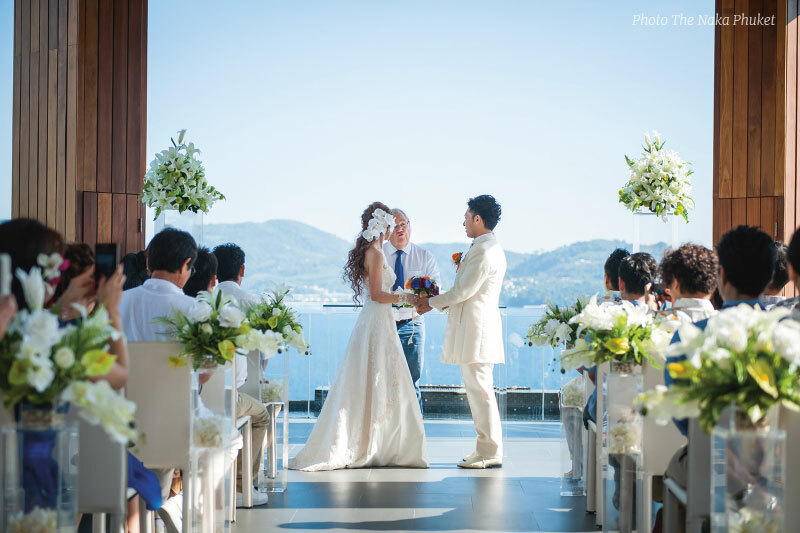 The magical island of Koh Samui is ideal to tie the knot. 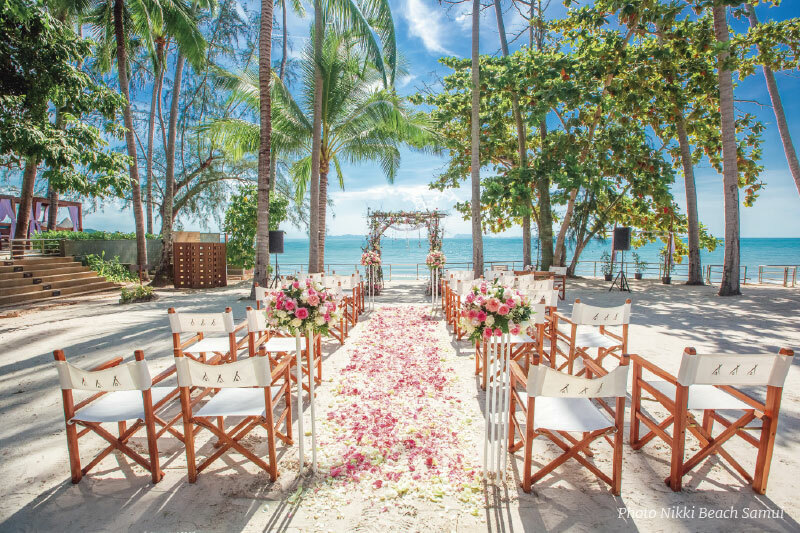 Plan a wedding to remember with striking backdrops, exceptional hospitality, expert culinary teams and a personalised touch at one of Koh Samui’s extravagant resorts. Koh Samui, Thailand’s third largest island, is famed notably for its beaches. But it’s also gaining a reputation for its environmental awareness initiatives and promoting well-being through its yoga retreats, spa therapies and healthful dining. 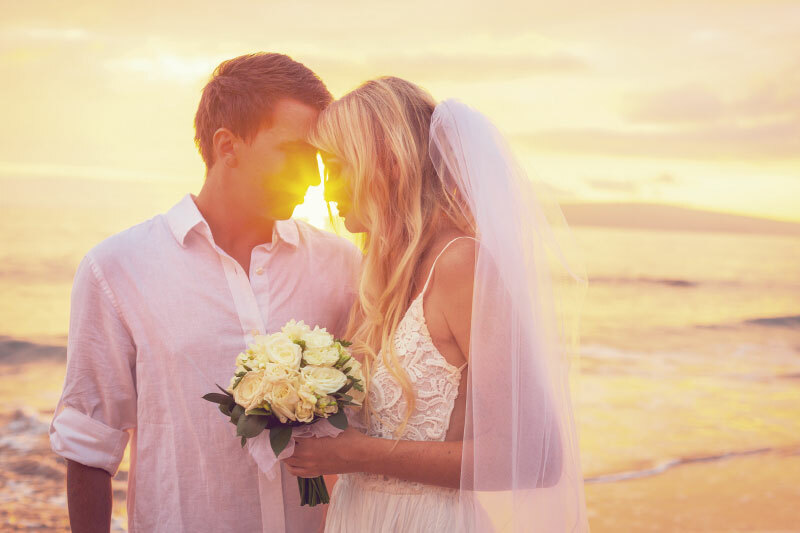 It now hosts a large variety of travellers, and the island’s uncanny ability to fit in travellers with different tastes, preferences, and budgets, while retaining its unique local culture, makes the island paradise a great destination for weddings. Many properties are set on a private beach, often with dramatic views of the Gulf of Thailand. The island’s breath-taking coastline, expanses of golden sand, sprawling lawns, and bright blue waters all form an idyllic backdrop for your fairy-tale wedding. Whether it’s a tropical vibe, or whimsical southern Thai architecture, or unrivalled views, all can create a sense of awe. Some resorts sprawl over 20 acres in isolated areas or hills. Others provide spaces that jut out 120 meters into the sea, creating a dream-like feeling of watery expanse and weightlessness. Numerous enchanting venues can host either intimate ceremonies or grand weddings. And you don’t necessarily have to travel far from Samui International Airport. Several resorts are just 10 minutes away, with pickup services easily arranged to and from there. Getting around the island can be arranged by the hotels; metred taxis on the island abound and daring souls who want to rent motorbikes may do so at their own risk if they are experts at manoeuvring sharp curves along the road. Wedding themes offer Thai and Western wedding ceremonies, which includes blessings from Thai monks and other local rituals. Themes can also come from the space itself – is it water, lush greens surroundings, or hills with a view that couples want, and what kind of emotions do they want to evoke? On Koh Samui’s more virgin north shore, guests can feel like they’re more isolated with its magnificent beach frontier. Whether it’s a gorgeous garden oasis or a golden sand beach, wedding festivities can feel very far removed from mundane reality. 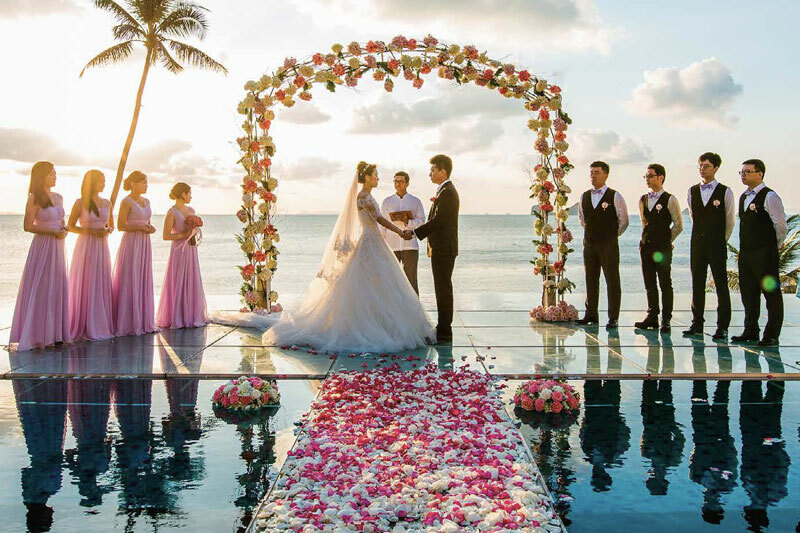 All in all, Koh Samui guarantees lush green natural landscape, private bays and ambiance of discreet charm offers an unmatched backdrop for a vow exchange. 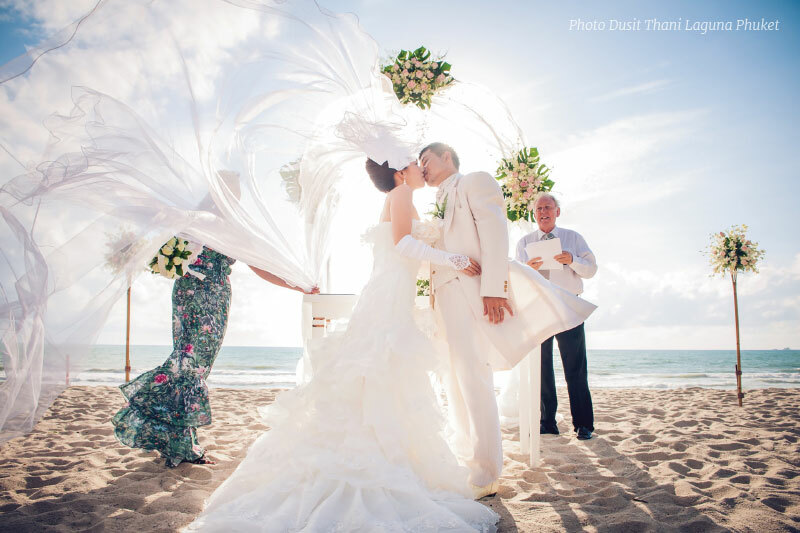 Phuket is another natural choice for a destination wedding, and the biggest island of Thailand that sits on the Andaman Sea. The Tourism Authority of Thailand (TAT) website points out the many beaches to visit and note the fact that Laem Phromthep Viewpoint features the most beautiful sunsets in Thailand for even more romantic moments. For a beach break, cultural elements include classical architecture and heritage spots, the famous Phuket nightlife, and world-class shopping. In Phuket, I had a chance to attend an intimate destination wedding at a resort situated in the unspoiled Kamala Bay. The resort offered two natural settings – a private beach and an untouched hillside. Additionally, I have also been invited to a destination wedding in Phuket at a resort that has access not to one, but to three beaches. At the resort, verdant greenery rolls down to golden sand beaches, which gives way to blue waters that stretch out to the horizon. The wedding functions were hosted at the resort’s chic beach club, beach lounge and beach restaurant, amongst other venues. I have also been lucky to attend destination weddings in Bangkok, Pattaya, Rayong and Hua Hin in Thailand. The nuptial in Bangkok is one of the best weddings I have experienced. The first night of the extravagant revelries was held at a popular Bangkok rooftop bar, overlooking the city’s dazzling skyline. The next day, a leisurely pool party was organised for the guests at a lavish hotel’s pool deck, followed by a cocktail night and wedding ceremony at the hotel’s grand ballroom. The in-house events team of all the venues seemed to have extensive knowledge of Western, Thai and Indian weddings, and offered highly personalised service. Couples usually wed during the cooler months of November to February, when the rainy season has departed. From May to October, the skies may be grey, but Thai people are unfazed by this as sporadic showers are mostly of a short duration and the sun continues to shine. One thing to consider for the rainy season are special packages and offers during these months, since airfares may be lower with special hotel discounts prices offered during the so-called “green” season. Thailand offers spellbinding retreats that serve as a romantic setting for a celebration of love. I hope to keep coming back to Thailand for more destination weddings, and one day even host my own destination wedding in enchanting Thailand! Some tips for guests to survive a taxing destination-wedding season include booking flights in advance, packing the essentials, drinking responsibly, being social, and always respecting the venue and laws and etiquette of the country. On the other hand, hosts should pick a venue which is easy for their guests to travel to and offers a good team of professionals to help plan the festivities. Finally, both hosts and guests should let their hair down and enjoy the merriment!